Mint color is really on the move. If you told me that couple of years ago, I wouldn’t be thrilled by the news … luckily my love for the color changed over the years. In the last few weeks I wore more blue-green colors. So it was time to reach for green-blue nail polish. And even though Alessandro Peppermint Patty is right in between pastel blue-green and green-blue, it’s still more blue than the shades I wore in last couple of weeks. It applies similarly as majority of pastel shades. Loaded brush, as little strokes as possible and 2 coats get the job done. Tip: if I ever mange to make a mess (aka bold spots) with pastel nail polishes, I put on fast drying top coat, wait couple of minutes, apply the third coat where needed and then cover the third layer with fast drying top coat. If I skip the first top coat layer, I tend to get pretty messy third layer. Something maybe worth trying for those of you who are like me and don’t have steady hand. This is not creme nail polish, but the shimmer is so tiny, that you don’t really see it. Color is really gorgeous and for some reason I kept picturing butterfly’s over it … so I stamped few on. I chose black stamping nail polish (old Essence one) because I wanted to make few shiny butterfly’s with Finger Paints Twisted flakie … and black is the best base if you want to achieve the maximum effect. Dark blue would be even better, but I don’t have one for stamping. if you’re not sure if you have enough top coat on the brush or not, go with the instinct and load more top coat on it. How do you like the nail polish and what do you think of my butterfly heaven? P.S. If you think that you see flowers in this mani – you are mistaken. Those are only flower like thingies in my fantasy land. 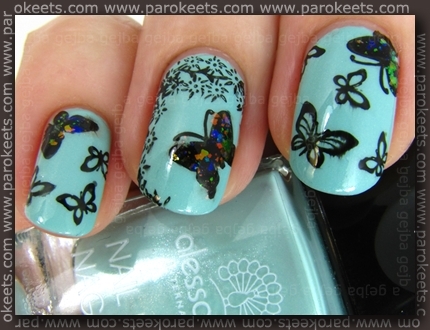 ♥ this color and ♥ the butterflies too! Waw! Kok je lepa barva! Genius! I love the idea of putting the flakie over black stamping! Vaaauuu, metuljčki s krpicami! :stars: Kolk je pa tole luštno! a je odtenek iz kakšne LE ali je iz redne linije?